GIS industry trends gain be gleaned by surveys and other reports produced by market research companies. While most of these reports can only be fully read after purchase, the executive summaries allow for an overview on the state of the GIS industry. 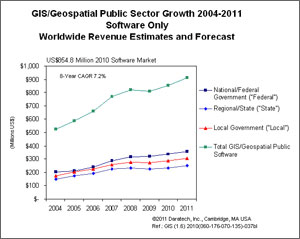 The GIS Industry according to Daratech, a GIS research firm, grew worldwide 10.3% in 2010 to US$4.4 billion with a forecast of an additional 8.3% growth to almost US$5 billion in 2011. According to a new report on the GIS market (Geographic Information Systems (GIS): A Global Outlook released January 2012) from Global Industry Analysts, Inc (GIA), the GIS industry is expected to growth to a worldwide to US$10.6 Billion by 2015. The healthy growth posted by GIS industry was however interrupted by the global economic crisis during 2009-2010. European governments stopped purchasing GIS technology during the period in anticipation of low tax collections. Meanwhile, the North American GIS market remained comparatively strong, largely due to the efforts of governments to improve homeland security. Expenditures on GIS technology however, rebounded significantly in 2010. Despite the immense popularity garnered over the past few years, certain issues continue to hinder market growth. Integration of the technology with cloud technologies remains one of the major challenges for the industry. 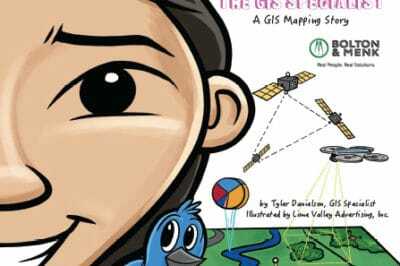 A major factor hindering growth of the GIS industry is the high cost associated with the technology. Although, prices have declined in the recent past, the technology is still considered to be expensive for smaller companies. Going forwards, as the significance of geospatial technologies and content increases, conventional markets such as governance and infrastructure sectors would continue to strengthen. Defense is expected to remain the single largest market for geospatial technologies while demand from infrastructure development sector is also expected to grow. According to Daratech which published its GIS/Geospatial Market Report in 2011, the largest demand is for GIS data, which has grown at a compound annual rate of 15.5 percent for the last eight years. Global sales to governmental agencies remains strong with an 7.2 percent compound annual rate over the last 8 years. Of those sales, local government drives the majority of growth as compared to regional and state level government sales. GIS is still continuing to emerge and expand into other markets. Visible and easy to use geospatial technology such as Google Maps, the dominance of location based services on smartphones and tablets, and the proliferation of mapping in media especially during times of natural disasters (think of all the maps and geographic information that proliferated during the Japanese earthquake and tsunami as a recent example) are all helping to proliferate the use of GIS. Also helping to push GIS forward is the emergence of crowdsourcing geographic data such as the OpenStreetMap project and Google’s MapMaker. For example, Nokia recently announced its own crowdsourcing effort. Open MapQuest is also gaining acceptance, especially in light of Google’s pricing structure for high volume Google Maps usage. The ability to visualize geographic data is becoming a standard and required part of many businesses. Can you imagine trying to launch a successful real estate tracking app without mapping services embedded within it? 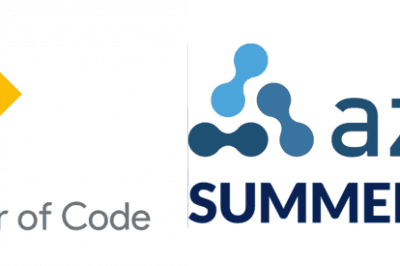 The adoption of HTML5 as the preferred technology for online mapping. Open source GIS will continue to grow and start to take its place among the commercial options as preferred desktop, mobile, and online mapping software. GIS will move beyond the simple display and query of online mapping and companies will debut technology that provides more analytical and data processing capabilities via the cloud.